When selling a property “As-Is,” it’s easy to fall into the trap of thinking that you don’t have to disclose anything else about the property. However, if you don’t carefully define “As-Is” in the contract, and make the necessary disclosures, you could be setting yourself up for unwanted liability. 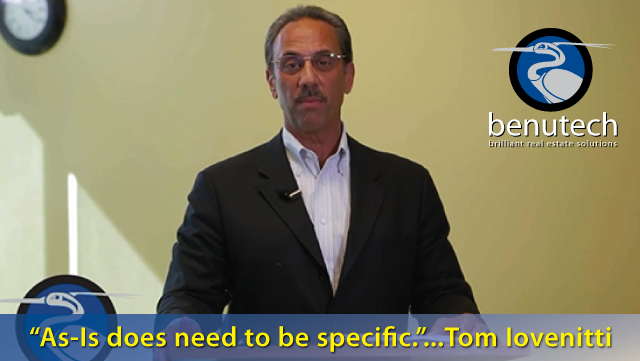 In this video, Tom Iovenitti goes into the “As-Is” clause in greater depth, helping you understand what you really need to incorporate in an “As-Is” contract. Most of you know that “As-Is,” well, it’s subject to disclosure. And in most contracts, most real estate agents and even sellers believe that “As-Is” means that whatever’s wrong with the house they don’t need to say anything. But I need to tell you, “As-Is” has a couple of components that need to really be looked at in specifics. One. “As-Is” does need to be specific. It’s important that there is full disclosure on the “As-Is” and what it entails in the purchase of the property. Another thing is, you need to outline the conditions of what “As-Is” really means. And I know this is going a little further than trying to say “well, it’s in the contract, so therefore it’s relevant and it’s an agreement/term/condition between the buyer and seller.” But more than not, you will have problems with it if you are not specific to the terms and conditions outlined in the disclosures beforehand. One other thing is, in order to offset the liability in “As-Is,” I believe that there needs to be an outline or an insertion into that clause that you, the real estate agent, should take very seriously. I think if you do something in that term you’ll find yourself offsetting the liability and making it very clear through the contract prior to sale that everybody understands how “As-Is” really is. Anyway, this is Tom Iovenitti from Benutech Incorporated. I just wanted to bring you this little tidbit, and I hope it helps you in your real estate career. Thank you very much for attending.